Jenny & Reza’s Fabulous Food Academy starts sizzling on Food Network! 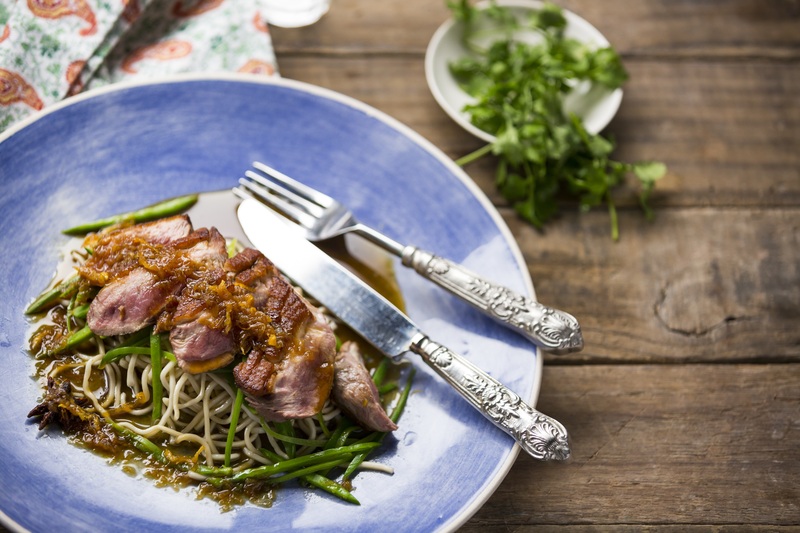 A five-week 25 episode series ‘Jenny & Reza’s Fabulous Food Academy‘ kicked off on Food Network (channel 175) today, and sizzled with the preparation of duck breast and Veal Escalopes. Hosts and Chefs Jenny Morris and Reza Mahammed taught six food lovers with varying levels of cooking skills how to make a delicious looking duck breast served with glass noodles and julienne mange tout (Chef Jenny’s dish), and Viennese crumbed veal escalope (Wiener Schnitzel, demonstrated by Chef Reza). The programme kicked off with an overview of what to fry one’s foods with, being butter, and various oils, depending on the heat of the pan. The show was filmed in-studio in Cape Town. Chef Jenny showed the Fabulous Food Academy students how to score the fat on the duck breasts, to rub the non-fat side with salt and pepper, and to rub salt onto the fat side. She said it was important to not cut too deep, not getting to the duck meat. Chef Reza used the Viennese waltz as a beat count in dipping the beaten veal escalopes (to soften them) in flour, then in beaten egg, and finally in Japanese Panko crumbs. The schnitzels were fried in a mix of butter and oil. He served the schnitzels with a tomato and olive salad. I attended the launch of the Food Network show recently, at a fun lunch at Chef Jenny’s Cook’s Playground in De Waterkant, which was attended by Chef Reza too, who is based in London. It is immediately evident that Chefs Jenny and Reza have a long-standing friendship and they make cooking look like so much fun, through their interaction with each other. Chef Jenny told the story that Chef Reza could not say ‘Buber‘, so he remembered it via singing a song ‘La Buberata‘! Chefs Jenny and Reza met ten years ago at the Good Food & Wine Show in Cape Town. Jeny and Reza’s Fabulous Food Academy is entertaining to watch, but also educational for food lovers. While I was chatting to Chef Jenny, she revealed that she is moving her Cook’s Playground across the road to the Cape Quarter, into a 600 sq meter space. She also told me that she is opening Yumcious Café where Celtic Cove used to be at the Cape Quarter on 1 December. She will be offering a weigh-and-pay lunch table with Mediterranean foods, cakes, homemade breads, muffins, good coffee, cordials, and more. She is launching a new branded wine with Perdeberg, and launches a new cook book later this week. Jenny Morris is a chef with boundless energy, and even travels to Dubai and Abu Dhabi to participate in food shows. Disclosure: We received a goodie bag with a magnum of The Fabulous Food Academy branded wine, and a most handy Slimline Power Bank cellphone charger. 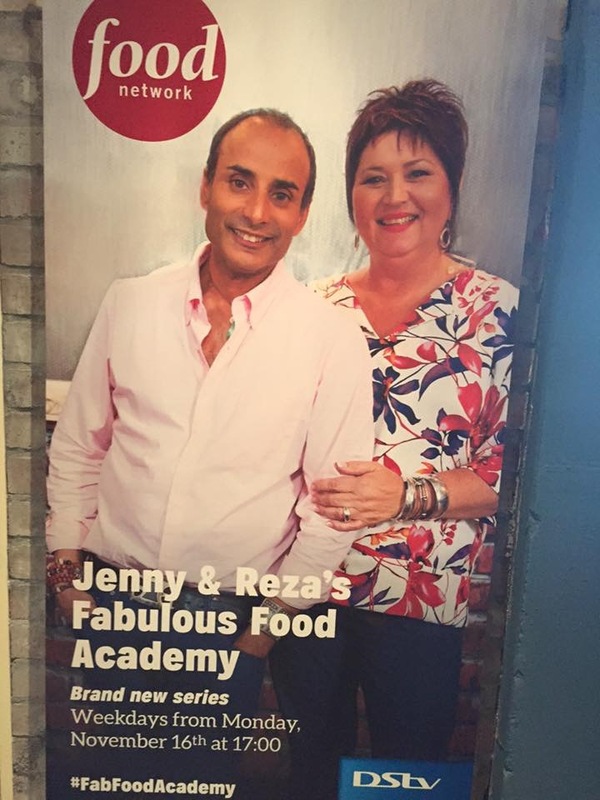 Jenny & Reza’s Fabulous Food Academy, Food Network channel 175, DStv. #FabFoodAcademy www.foodnetwork.co.za Monday – Friday 17h00.